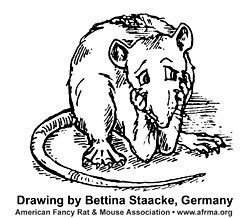 This article is from the Fall 2002 AFRMA Rat & Mouse Tales news-magazine. QI’ve got a question for you about fancy rats. Do they feel depressed when the person they grow to like doesn’t take them out themselves? I ask this because I went out of town with my friend and her family for four days and when I got back in the afternoon on the fourth day, my rat was skinny and she looked sick, but the next day she was perfectly happy climbing on our shoulders and on my bed. My mom took her out while I was gone so I’m totally confused. If you can answer my question, good, but if you can’t, that’s okay. Thank you for your time. P.S. How intelligent are rats? Really intelligent? ARats are very intelligent and it is possible that she missed you, but that would not usually cause one to stop eating. I amnot sure why she would lose weight. Was her water bottle working properly during this time? Sometimes a water bottle can get jammed and then if the rat doesn’t have water, it won’t eat. Did your mom give her extra treats while you were gone to make up for you not being there? If you go away again for several days and this happens, then it could be that she is super attached to you and doesn’t like to not have you there.